This is a cartoon of the Atlantic Meridional Overturning Circulation taken from Talley (2013). Warm surface water moves northward (to the right in this picture), before sinking in the Arctic and moving south in the abyssal ocean. This water eventually returns to the surface near Antarctica. The global overturning circulation, of which the Atlantic Meridional Overturning Circulation is a substantial component, moves large quantities of heat and water around the world. The heat and water have substantial impacts on regional and global climate. The movie “The Day After Tomorrow” was a Hollywood alarmist vision what could happen if this circulation stopped. There aren’t any scientists predicting such sudden changes. 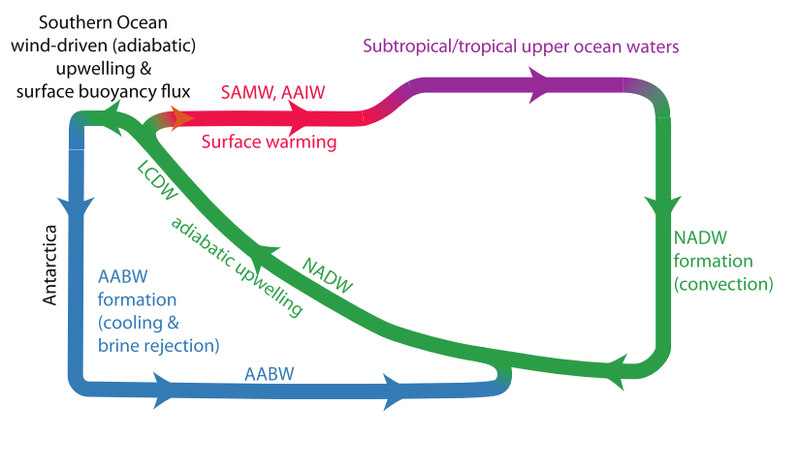 But, changes in the Atlantic Meridional Overturning Circulation lead to changes in sea surface temperature in the North Atlantic, which in turn are strongly linked to climate variations in the Northern Hemisphere. In 2005 a paper was published in Nature suggesting that the Atlantic Meridional Overturning Circulation had weakened by 30% over the preceding 50 years. This was a big deal. The research cruise that took the final measurement they based their paper on also put down an array of moorings to continuously monitor the Atlantic Meridional Circulation. I think my next point is best made graphically. The hollow circles are the measurements used for the 2005 paper. The solid circles are the minimum, mean and maximum values measured during the first year that the array was in operation. The measurements are given in Sverdrups (Sv). One Sverdrup is one million cubic metres of water per second. Data from Bryden et al. (2005) are plotted with open circles. 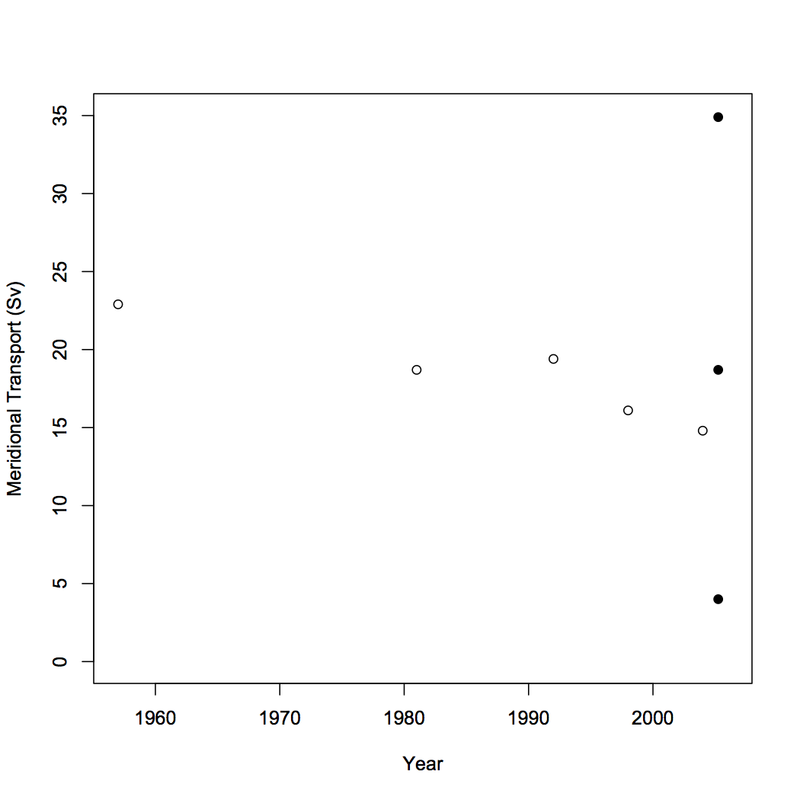 The closed circles are the minimum, mean and maximum values from the first year of continuous monitoring by the RAPID array, published in Cunningham et al. (2007). All of the previous measurements lie within one standard deviation (5.6Sv) of the mean (18.7Sv) reported by Cunningham et al. (2007). This means that there is very little chance of the observed 30% decrease being anything other than a side-effect of the small number of measurements. We’ve just seen that there is a lot of short term variability in the circulation, which means we need a lot of data to analyse if we want meaningful results. Unfortunately, collecting a couple of centuries of data is going to take us a couple of centuries. The short-term solution is to use numerical models. This is exactly the approach that a number of people have taken recently. One paper, Bingham et al. (2007), examined the meridional coherence of the circulation. This means they looked at the strength of the circulation at each latitude and time and related that to the strength at every other latitude and time. The result that is relevant here is that they always found a reduction in the coherence near the Gulf Stream. This suggests that the circulation north of the Gulf Stream didn’t correspond with the circulation to the south (I mean “correspond” in terms of have roughly the same strength, not in some strange anthropomorphising way). 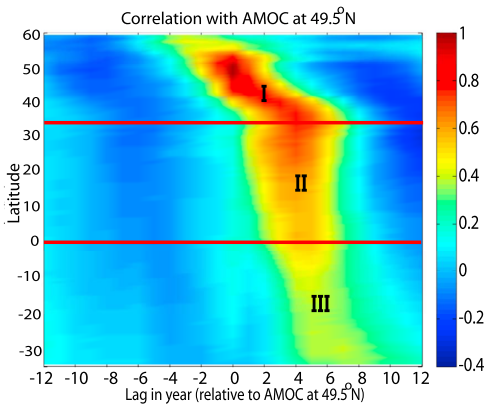 Following this Zhang (2010) used another global circulation model to look at the movement of anomalies in the circulation. This is particularly important under a changing climate scenario. What Zhang found is that the changes in the circulation’s strength move south slowly from the Arctic until they reach the latitude of the Gulf Stream, at which point their speed changes and they move south much faster. 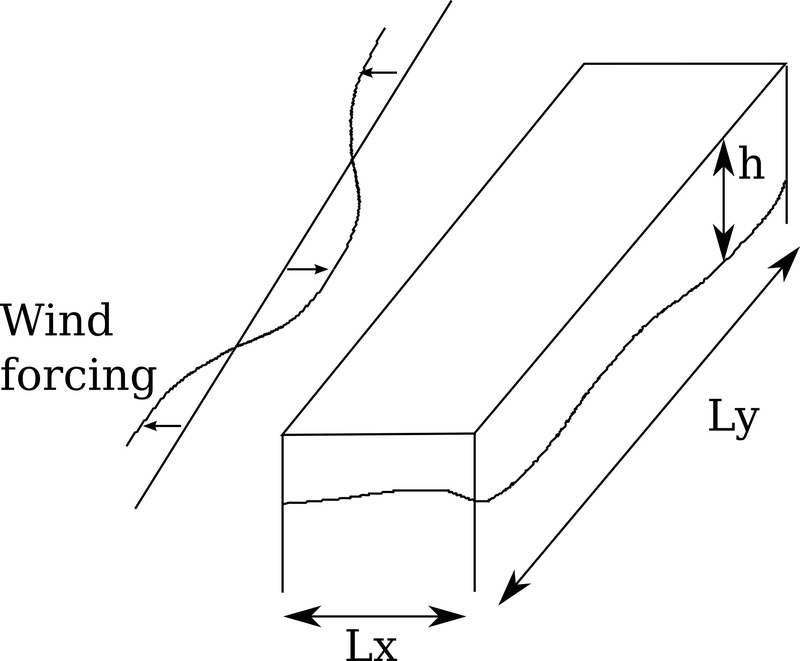 Movement of the changes in the overturning circulation computed by Zhang (2010). The y-axis is latitude and the x-axis is time. An almost horizontal slope means that the anomaly is moving south very slowly, as can be seen in the top section. The more vertical section shows the anomaly moving south at a much higher speed. 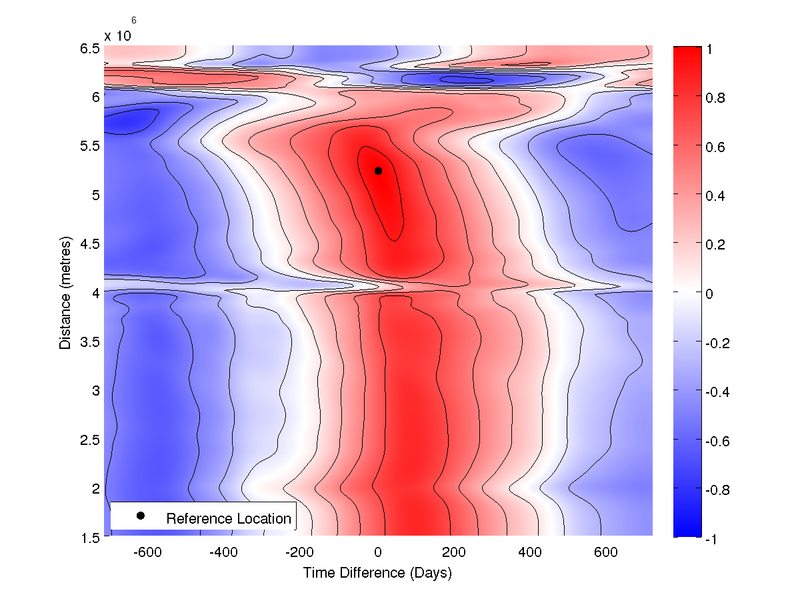 I’ve been using a simplified model to investigate the Atlantic Meridional Overturning Circulation. The model has a rectangular, infinitely deep ocean with one, two or three active layers. To make the ocean move I have wind blowing over it, but the “wind” is very idealised; it’s speed depends only on the latitude and does not change with time. My model. This picture shows one active layer and a schematic of the wind. Obviously the Atlantic is neither a rectangle nor infinitely deep. Those are simplifications that will (hopefully) allow me to do more in depth analysis of the results. The results are very promising; this simple model produces a propagation pattern that is very similar to the one computed by Zhang (2010). The pattern of propagation from my simple model. This means that my model is complex enough to reproduce the pattern seen in much more complex models. This in itself is interesting, but the plan is to work out exactly what determines the speed at which these anomalies move and the mechanism by which they change speed so abruptly. The actual presentation can be found here. But, it is a collection of slides to talk with, not a standalone document, so it might not make much sense on its own.